You can now create a tryout that will not only show up on your Team site, but it will now also be pushed to your league site as well if you are linked to a league. 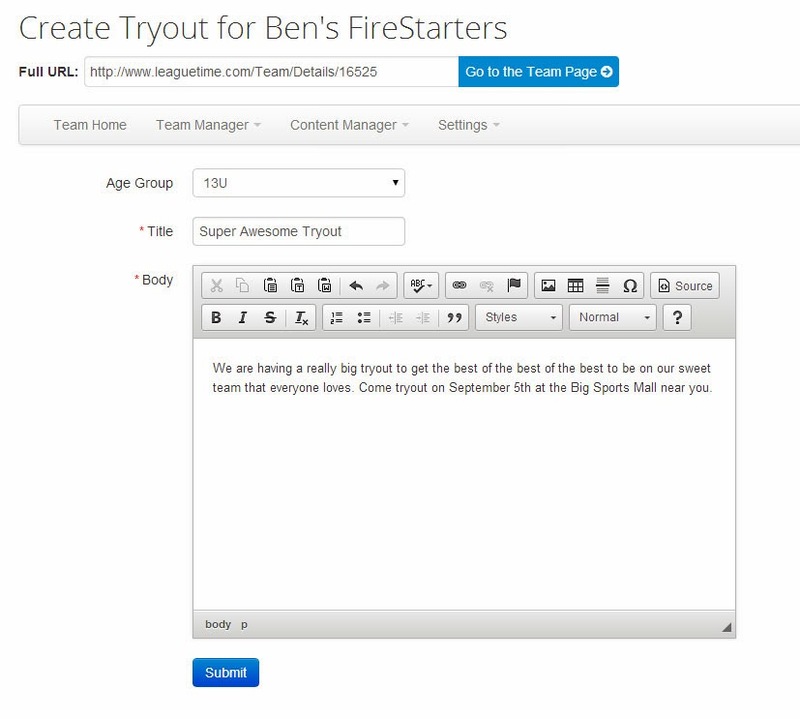 Here are the steps to create a tryout on your Team site and the League site. Login and click on My Teams on the left hand navigation menu. Then click on the name of the team that you want to add a tryout to. When you click on the name of the team it will take you to your Team Dashboard where you can manage all of the content on your Team site. Once you are on your Team Dashboard you can click on Content Manager and then in the drop down menu select Tryouts. Now that you are in the Tryouts area you can click on the big +Add button to begin creating your Tryout. Add in all the appropriate information and click on the Submit button. This will save the Tryout to your public Team site (located under the More menu). If your team is part of a league that is also using LeagueTime for its league website then your Tryout will automagically show up under the league's public website in the Tryouts area. The official Blog for LeagueTime.com, where we will be posting tutorials, showing off new features and keeping you up-to-date on all the latest LeagueTime news! Have Questions, Comments or Ideas?